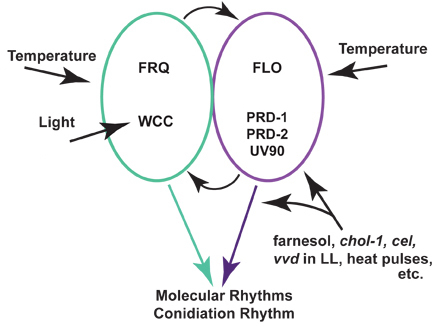 Our model for the circadian system of Neurospora: two oscillators mutually interact. 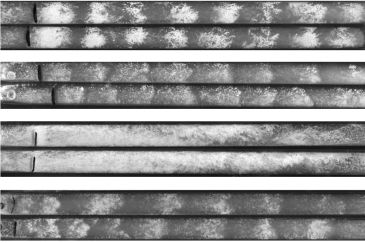 Four sets of duplicate race tubes, growing from left to right. Top: our standard lab strain. Second: the chol-1 mutant, rhythmic. Third: The frq-ko null mutant, not rhythmic under these conditions. Fourth: the double mutant chol-1 frq-ko, rhythmic; this set is displaying a FRQ-less rhythm. 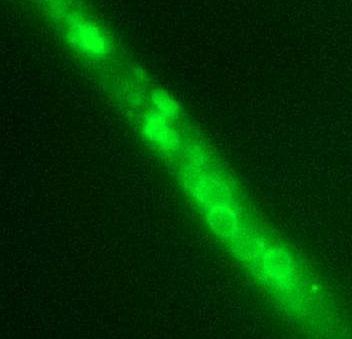 The UV90 protein tagged with Green Fluorescent Protein localizes to the vacuoles.